It’s not like we have no extant biographies of the remarkable and enigmatic poet, novelist, singer and songwriter Leonard Cohen. They abound. Neither is it the case that a biography has not been published recently. A quick Google search brings up several recent offerings, most notably Tim Footman’s Hallelujah: A New Biography (2009) and Anthony Reynolds’s Leonard Cohen: A Remarkable Life (2011). So … why another? Members of the Cohen club who have read these previous works know all about the songwriter’s home on the Greek island of Hydra, about Phil Spector, Joni Mitchell, Suzanne, Roshi, Mt. Baldy, Jikan, the women, the drugs, the anomie, the depression, the suit factory and all the rest of the improbably glorious lore that makes Cohen a musical icon. So why should a reviewer strongly recommend that fans … and especially non-fans … of Leonard Cohen read a new bio? To answer this question, I will invoke an old Talmudic device, with which Leonard Cohen—he who still lights Sabbath candles every Friday evening and celebrates Hanukkah with his children and grandchildren and who never really understood why Bob Dylan gave up Judaism—will surely be familiar. I’ll answer the question with other questions. How many times has Beethoven’s Ninth symphony been performed? How many times has Hamlet been staged? Are all performances equally good? After all, they’re based on the same scores, the same scripts. So wherein lies the difference between Leonard Bernstein’s conducting of the New York Philharmonic performance of Beethoven’s Ninth and that of the Southeast Cupcake Village Symphony’s rendition featuring the beloved yet vocally limited town librarian? Is Kenneth Branagh’s version of Hamlet worth seeing even though you’ve already witnessed the Prince of Denmark reminiscing about “poor Yorick” dozens of times? I cast no aspersions on previous biographies of Cohen, but the conductor of this one tops the list of music journalists and writers. Consider Sylvie Simmons a Bernstein, a Branagh. I will not spend the majority of this review on the details of Leonard Cohen’s life. After all, this is the reason readers would buy the book. However, as aperitif or appetizer I will offer something that marks the man in a unique way. 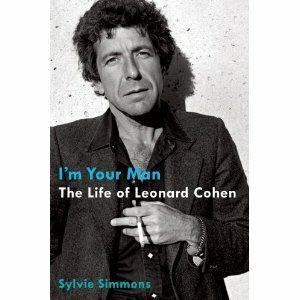 Leonard Cohen, we learn in I’m Your Man, loves to shave. We are hard-pressed to think of any photo of Cohen with beard, moustache or stubble, despite his career’s long arc, through decades where facial statements came and went. Why does he love to shave? Simple – he was a good son who listened to his mother. Simmons reports that when he was young, Cohen’s mother advised him that when stressed, confused, or troubled, he should stop whatever he was doing and shave. (Where his mother received this wisdom is lost to history—I don’t think it’s in the Talmud.) Cohen took this advice seriously throughout his life and often shaved to reduce stress. Just before one major concert, near curtain time and with a huge audience growing impatient, Cohen summarily announced that he needed to shave. He left his band and back-up singers standing backstage, ready to go, and retired to his dressing room. He calmly (and calmingly) lathered up, then re-emerged, smooth-faced and renewed. He boldly led the group onto the stage. We also learn that Cohen loved to fast for days on end … and fall in love …. and fall out of love. Simmons shares the delicious details in a consummate journalistic performance. I’m Your Man feels noteworthy. Simmons has already shown herself to be an accomplished biographer with distinguished volumes on Neil Young (Reflections in Broken Glass) and Serge Gainsbourg (A Fistful of Gitanes). Her chops as a biographer matter. In the wake of problems with former New Yorker staff writer Jonah Lehrer—he admitted inventing quotations attributed to Bob Dylan—a reader cannot help but be extra skeptical when biographers give us words said to emanate from Leonard Cohen himself … or from Judy Collins, or from Cohen’s myriad lovers, or from his many friends. Simmons, in this case, actually spoke with them all, even those now very far along in years. After her epilogue, efficiently as any scholar, she includes nearly two dozen pages listing sources for every citation and quotation. Further, a complete index makes the book a primary and secondary source for readers interested in scholarly questions about Cohen’s work and life. Clearly, we have here more than a simple biography. Simmons’ carefully researched work feels definitive. It can be trusted. Even better, Simmons is a wonderful writer. She describes events with engaging clarity and a command of language that oftentimes enthralls. Witness her description of Cohen’s state of mind immediately after the birth of his son, Adam. Even if Leonard was not wild, he clearly felt trapped. At the same time, his upbringing, his patriarchal roots, his sense of duty ensured that he could not shrug off fatherhood. He returned home, but reluctantly and impossibly weary. He was depressed. It was hard work, trying to find a way to keep going and not be pulled off course. A less skilled writer could have written: “Leonard was ambivalent about being a father.” Simmons plays the same notes … but how different her music. Leonard sat in his room in his house on the hill in Hydra, writing furiously. He was driven by an overpowering sense of urgency. He had the feeling, he said, of time running out. This was a strange sensation for a thirty-year old man, unless he were Jesus, or seriously ill, or thinking about suicide. Accordingly, Simmons has earned much recognition for her work, especially in the domain of music journalism. She has interviewed and written about major luminaries: Rod Stewart, Mick Jagger, Johnny Rotten, Steely Dan, Adam Ant, Black Sabbath, The Clash, Michael Jackson. She authored a book based on the final interview ever held with Johnny Cash, only six weeks before he died. The Cohen bio runs very long, at almost 550 pages. Details extend to the names of each musician on each of Cohen’s many albums. For some, this may be overkill, oversaturation. For others, it will be Beethoven’s Ninth. Along with the exhaustive detail comes something unexpected for those of us not in the music industry—we get a peek backstage into the creation of music that we have heard and treasured for decades. Cohen survived in a very hard world, even for the most talented of performers. Guns, drugs, back-biting, back-stabbing, broken promises, betrayal, embezzlement, misappropriation of life savings to the point of penury, stolen ideas, frustrating delays, loves lost, loves regained, wars, emotional depression … never mind. Our indefatigable Mr. Cohen seems to have never met a roadblock he couldn’t handle. A national treasure and a hero in his native Canada, a mega-star in Europe, then slowly at first, yet surely now a major musical figure in the U.S., Cohen now draws near 80 years of age. He continues to write and perform, to thrill and amaze … and, yes, to depress the hell out of us. Read I’m Your Man. It will take some time, but think of it the way you think of slow food. It sustains. Like listening to one of Cohen’s songs, this complex, beautiful biography requires you to stay with it, to think about it. This book will stay with you. It will change the way you hear Leonard Cohen. Dr. Marshall Duke is Candler Professor of Psychology, Emory University, and a long-time listener to the music of Leonard Cohen.